For one winner, in this latest Best Sommelier of the World contest, there are 65 candidates who don’t make it there. Impressions and reactions from the semi-finalists and other candidates are quite a mix, from thrill to disappointment. But everyone who participated praised the quality of the program and the opportunities for learning, whatever their results. Andrea Martinisi, semi-finalist from New Zealand, testified to the demanding character of the ASI Best Sommelier of the World competition. “Emotionally, it’s a bit of a roller coaster. There is a lot happening. It’s been a hard few days, but I’ve done my best, so no regrets.” Same for Loïc Avril, from Australia, who certainly was hoping for a shot at the finals. “It’s a marathon. A very long run. You need to take a single step at a time,” he said, adding that the waiting between the end of the semi-finals on Wednesday and the announcement of the finalists was particularly unnerving. Having master classes helped him remain positive and patient. Despite his deep disappointment after the finals, where he felt he’d missed the mark, Raimonds Tomsons from Latvia spoke eloquently of the sacrifices made as a young father preparing several hours a day to prepare for the great event (“I have a great wife,” he said convincingly). He also mentioned he loved what the semi-finals had to offer. “It was dynamic, very fast, lots of tastings, very specific practical tasks as well – and very tough.” Always ready to challenge himself, he just announced that he will take another run at the world title in 2022. Others, like Martynas Pravilonis, pointed out the impact of the competition’s growing visibility. “I think the sommelier profession will grow, because it’s such a good show,” said the semi-finalist from Lithuania. Many of those who didn’t make it past the first round remained entirely positive about the experience. Dustin Chabert, the first American candidate in many years, didn’t feel let down by his elimination after the first round, which he saw as a “glass half-full kind of situation”. “Conversation with wine people from 65 different countries is [really] awesome”, he added in a colourful Facebook post, after the end of his competition. Indeed, opening new horizons and worldwide conversations is a big part of what the ASI Best Sommelier of the World contest is all about. Thanks to the hard work by the Belgian organizing committee, everyone who took part in the 2019 ASI Best Sommelier of the World contest had a great opportunity to discover Antwerp’s eclectic mix of history and modern character in everything from architecture to food and culture. Candidates, delegations, journalists and other participants had the chance to see and taste all sorts of local specialties, like fries, chocolates, diamonds, beer, and even Belgian wines! A dozen or so master classes were also offered throughout the week, creating learning opportunities for the candidates and participants, with a wide range of programs, from a vertical of eight vintages of Château Beaucastel’s Hommage Jacques Perrin cuvée to an exploration of biodynamics and Languedoc terroir with Gérard Bertrand, a presentation of ancient Catalan grapes revived by Torres Family, and more technical tastings exploring the effects of bottle size or closure permeability on wine profiles. “It’s very good, because competitions like this are all about learning,” commented Martin Bruno, the semi-finalist from Argentina, when asked about the week’s program. “There was a high level of quality and knowledge in the master classes, especially on Thursday and Friday,” concurred Satoru Mori, the Japanese semi-finalist. Austrian Wine and Côtes du Rhône, in particular, offered the candidates and other lucky attendees the opportunity to discover the best their regions have to offer during their platinum master classes, while also supplying a vast selection of wines, changing every night, at the Bar des Sommeliers – with many somms spending time at the bars taking notes, even well after regular hours. “An amazing and inspiring program,” insisted Reeze Choi about the Austrian and Rhodanian contributions to the program. 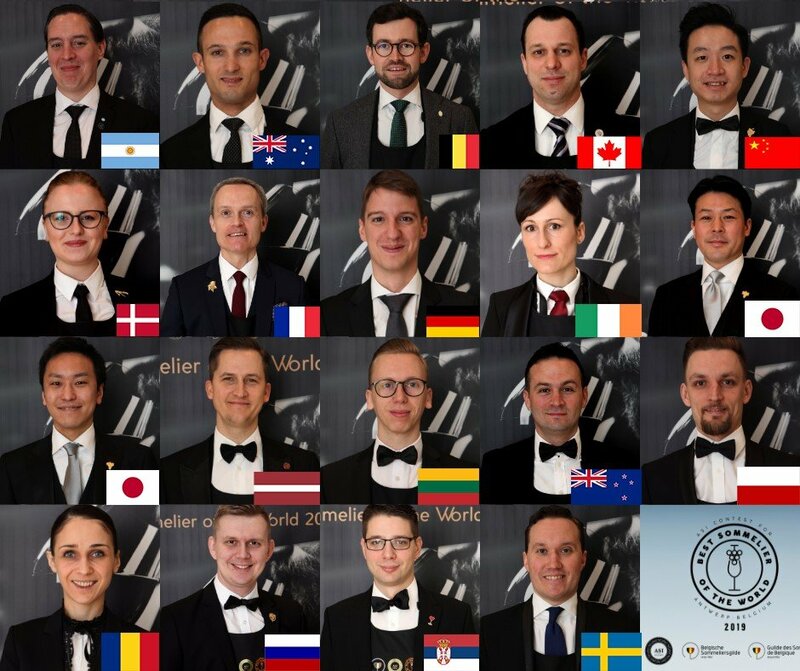 The complete list of the 2019 ASI Best Sommelier of the World contest’s partners is available here. Thanks to all of them for making the event so memorable. Antwerp, March 15, 2019–At the end of a final round where the three top competitors had to show their knowledge of wine and talent for service and hospitality in front of an audience of over 1,100 people, Marc Almert, a 27-year-old sommelier from Germany who works at the Baur du Lac Hotel in Zurich, was declared the winner of the 2019 ASI Best Sommelier of the World. “This week has been like a dream, and the dream has come to its conclusion without waking up. I’m honored and humbled to walk in such great footsteps,” declared an elated Marc Almert, after the announcement was made on the stage of Antwerp’s Elisabeth Centre, where three finalists had been competing in the last of three rounds of demanding tests covering every theoretical and practical aspect of the sommelier profession. The three finalists, Marc Almert, as well as Nina Højgaard Jensen, of the Kong Hans Kælder restaurant in Copenhagen, Denmark, and Raimonds Tomsons, from Vincents restaurant, in Riga, Latvia, had been announced earlier in the afternoon, just before the finals began, so candidates had to be ready to go immediately. Nina Højgaard Jensen finished second and Raimonds Tomsons, third. Will a woman finally win the title? Where will the winner come from? Will it be an established star or a surprise winner? This – and much more – is what we shall find out on the evening of March 15th, at the outcome of the contest finals, in the wonderful Elisabeth Center, in downtown Antwerp. Those who will be in Antwerp and would like to attend the finals can procure tickets at www.BestWorldSomm.com. Others will be able to follow every stage of the competition through social media, and even a live streaming of the final round through ASI’s YouTube and Facebook pages. Or follow every stage of the competition on social media, or via the live streaming of the final round on ASI’s YouTube and Facebook pages. Andy O’Gorman and all the team at the Irish Guild of Sommeliers wish Julie the very best of luck this year, as indeed do everyone in the trade here in Ireland. Hopefully this will be Julie’s year to win the gold medal. Good Luck to You Julie. The World’s Best Sommelier Competition has been in existence since 1969. The competition facilitates exchanges between numerous hotel and restaurant professionals, encourages healthy competition between entrants, motivates them to perfect their skills, and helps widen knowledge of the sommelier profession in the public at large. The competition takes place every three years in one of the ASI member countries that has been authorized to host the event by the ASI. It is with great sadness that I & the Irish Guild of Sommeliers learned of the death of Yves Durand, Atlanta Georgia. May He Rest In Peace. Yves was a great friend to me over many years. I met him at many international sommelier events in countries such as Japan, Croatia, USA, just to mention a few. Deepest sympathy to his wife Inge, his son Thomas (Robin), daughter Tanya (Darren), his two sisters in France, Nicole and Isabelle, plus five grandchildren and great grandchildren. Mr. Durand was a longtime member of The Commanderie de Bordeaux and Chaîne de Rõtesseur which helped him gain knowledge of all wines and ultimately achieve many awards including the following: In 1985, he was named Best Sommelier in French wines in the United States and was presented the award by Julia Child. In 1986, Yves represented the United States in Paris at the prestigious International Sommelier Competition. He placed first in the blind tasting category and third in the overall competition. In 1987, he wrote, Connoisseur’s Guide to Bordeaux Wines, twelve years in the making. Mr. Durand received one of the highest awards from the French Minister of Agriculture in September 1990 when he was decorated Chevalier de L’Ordre du Mèrite Agricole for his achievements in promoting French food and agriculture. In 1996, the National Academy of Television, Arts and Science presented Mr. Durand with an Emmy award for Outstanding Achievement in Individual Excellence/Performer for his GPTV program Wining and Dining with Yves Durand. 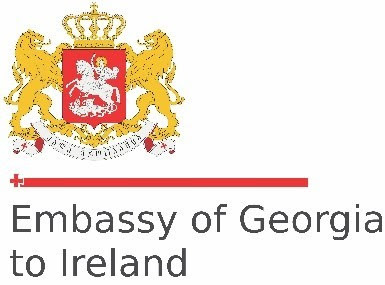 THE EVENT: The Italian Trade Agency will bring a delegation of 32 Italian wine producers from Italy and the islands to Dublin on Tuesday 5th February, 2019 from 12.00-18.00 Venue: Radisson Blu Hotel, Golden Lane, Dublin 8. The 32 producers presenting their wines all come from the regions of Abruzzo, Campania, Calabria, Emilia Romagna, Fruili Venezia Giulia, Piedmonte, Puglia, Sardegna, Sicily and Toscana all are seeking representation. THE “WINE EXCHANGE”: Borsa Vini means “wine exchange”, if you are looking for quality wines that are innovative and commercial, then this event offers the best opportunity for importers to update and expand their portfolio of Italian wines. MASTERCLASS: John Wilson, Irish Times wine writer will lead Masterclass to discover the wines from Italy north, south and central as well as the islands. Places are limited and will be assigned on first come, first served basis. With more than 100 unique grape varieties grown across 65 distinct wine regions, find out what makes Australian wine unique at the Australian Trade Tasting. Balnaves, Barossa Valley Wine Company, Brookland Valley, Croser, Chambers Rosewood, Charles Melton, Clonakilla, Cullen, Dalrymple, d’Arenberg, De Bortoli Wines, First Creek Wines, Giant Steps, Grant Burge, Grosset, Hardys, Houghton, House of Arras, Jansz, John Duval, Kirrihill Wines, Knappstein, Leasingham, Levantine Hill, Milton Park, Mitolo, McGuigan, McWilliam’s Wines, Mount Horrocks, Mount Langi Ghiran, Mount Pleasant, Patiritti, Petaluma, Plantagenet, Peter Lehmann, Reynella, S.C. Pannell, Shaw + Smith, Silkman, Sir Ian Botham Wines, St Hallett, Stonier, The Other Wine Co, Thomas Hardy, Thorn-Clarke, Three Lions, Tolpuddle Vineyard, Vasse Felix, Wakefield Wines, Willunga 100, Yalumba, Xanadu, Yering Station. McLaren Vale Masterclass 11:00 – 1:00 p.m. Places are limited and must be prebooked. They are offered on a first-come, first-served basis. Sad news of the death of one of Ireland’s top Sommeliers Didier Fiat, on December 28th, 2018. Didier was the Head Sommelier at the Kildare Hotel & Country Club for many years and was one of the emerging stars of the developing wine industry in Ireland from the 1980’s onward. Many of the countries top Sommeliers began their career under the tutelage of Didier, including Alain Brais and Simon Keegan. Didier represented Ireland at the ASI World Sommelier competition in Brazil in 1992 where he achieved 3rd place. It was an enormous achievement for him and the Irish Guild of Sommelier and was one of the pivotal moments in the growth of the modern wine trade in Ireland. Based in Kildare more recently Didier ran a small successful importing company supplying many of Ireland’s top restaurants and off licences. Our sincere condolences to his wife and children. Won the Sopexa Ireland ‘Best Sommelier’ in French Wines. Was awarded the Wine & Spirit Education Trust Diploma. He was also the Head Sommelier & Wine Buyer at the 5 Star ‘K Club’ for 14 years; has written wine articles for various publications such as Cara Magazine and Wine Ireland and even found time to give a few wine tasting presentations on the TV3 Show ‘Good Morning Ireland’. In 2005 Didier turned his full attention to developing Classique & Gourmet Wines Ltd. Details of all these events are in the wine diary.The 2019 trade tasting season will begin with a number of generic wine fairs: on Monday 14th January, 2019 the New Zealand Wine Fair- Flavours of New Zealand will take place at the Radisson Blu Hotel in Golden Lane, Dublin 8. Two days later at the same venue on Wednesday 16th January, 2019 The French Wines Discoveries Fair will see 35 French producers, all of whom are seeking representation on this market, heading for Dublin to do business. 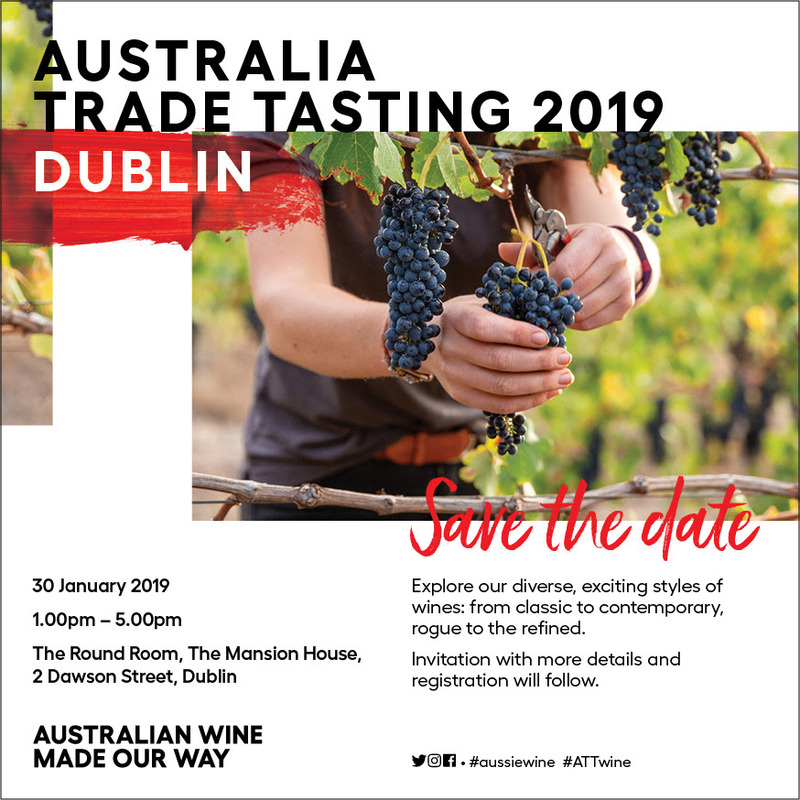 On Monday 30th January, 2019 the Australia Trade Tasting a showcase of premium Australian wines will take place in the Round Room of the Mansion House in Dawson Street. 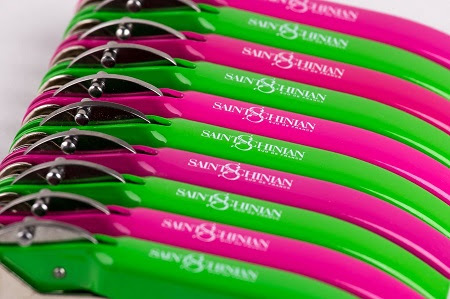 On Monday 4th February, the Saint Chinian AOP Wine Event, a group of producers from the region will hold an event in the Hilton Hotel, Charlemont Place. All are seeking representation. 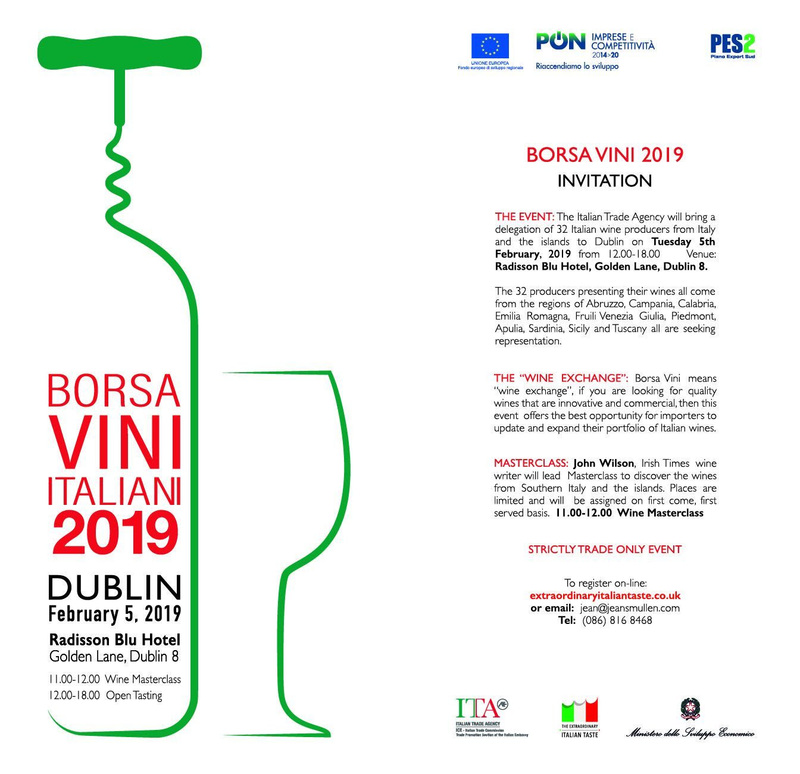 Tuesday 5th February, 2019, Borsa Vini the Italian Trade Agency (ITA) showcase, will bring a delegation of 35 Italian wine producers from Southern Italy and the islands to Dublin. The 35 producers presenting their wines all come from the regions of Campania, Calabria, Basilicata, Puglia, Sicily, Abruzzo, Molise and Sardegna and all are seeking representation. The event will take place in the Radisson Blu Hotel. Liam Aherne, Palace Bar, Dublin being presented with a portrait of himself which was commissioned by the Irish Guild of Sommeliers. Oliver J. Murtagh President of Irish Guild of Sommeliers making the presentation to Liam. Also included in the photo are Andrew O’ Gorman, Secretary Irish Guild of Sommeliers and Willie Aherne, Palace Bar. New Zealand Winegrowers will host its 22nd tasting of New Zealand wines in Ireland on Monday 14th January 2019 at the Radisson Blu Hotel, Golden Lane, Dublin 8. Time: 2.00-6.00 p.m.
Join John Wilson on a journey around New Zealand wine regions to showcase New Zealand’s classic regional and varietal expressions. Places at the Masterclass are limited and must be pre-booked. Please contact Jean Smullen to book. Sommeliers who have been to New Zealand onSommit, the New Zealand Winegrowers Sommelier scholarship have nominated their favourite Sauvignon Blanc discoveries on the trip. This is a selection of those Sauvignons which stood out to them and would work well on a restaurant wine list. Chardonnay is grown throughout New Zealand and strongly reflects our terroir and the huge regional diversity. A wide-range of Chardonnay styles are produced in New Zealand, from fruit-driven and unoaked, to luscious examples with complexity, elegance, and a touch of oak. This tasting is a small snapshot of what the country can offer for this most versatile of grape varieties. Willie Aherne’s Whiskey Palace at the Palace Bar, Fleet Street, Dublin was chosen as the first on-trade establishment to release a 17 year-old single cask Irish whiskey. Redbreast 17 Year Old Single Malt was exclusively bottled for Willie Aherne’s Whiskey Palace. A historic day here in The Palace, first Dublin pub, to have a redbreast single cask Irish whiskey. Exclusively bottled, yield of 540 bottles, 59.7%, 17year old from cask 18831. The whiskey was aged in a first-fill ex-Sherry cask. The result is a limited edition collectible whiskey. The whiskey was introduced at a tasting in the Whiskey Palace on 21st November,2018 at which bottles were released for general sale. Willie Aherne of the Whiskey Palace said: “Our shelves are already full of the finest selection of Irish whiskey but the addition of this label, unique to us, has been a dream in the making for many years. Since we announced that we’d be releasing the Redbreast 17 Year Old there has been great anticipation among whiskey collectors and enthusiasts alike. The Palace has attained international acclaim for its singular devotion to the promotion of Irish whiskey. In excess of 300 of the finest Irish whiskies can be savoured here attracting whiskey connoisseurs from far and wide. This excellent range of Irish whiskies has been developed by Willie Aherne. When Bill Aherne, acquired the palace in 1946 it was common for public houses to have their own bottled whiskey and The Palace Bar had the renowned “The Palace Brand Whiskey”. August 2011 The Palace Bar revived this tradition of having its own bottled whiskey again with the exclusive single cask “The Palace Bar 9 Year Old Single Malt Irish Whiskey” which was launched on 18th August, 2011. In October 2013 the Palace opened a whiskey bar called Whiskey Palace and on the same night launched a new whiskey called Palace Bar Fourth Estate Single Malt. The name the ‘Fourth Estate’ refers to the time when the journalists would frequent the Palace Bar and use it as if it were their office. November, 2018 Redbreast 17 Year Old Single Malt is a prestigious addition to their offering. It’s on sale in the bar for €25 a measure, with a bottle priced at €350. Today, the Palace Bar is run by Willie Aherne ably assisted by his father Liam. Oliver Murtagh, President and Andrew O’ Gorman, Secretary Irish Guild of Sommeliers attended the function last night on the invitation of Willie Aherne. This is the book for people who like their drinks bubbly and sparkling. An inspiring mix of classic cocktail recipes such as bellinis and mimosas, alongside exciting variations, Let’s Get Fizz-ical offers tips, tricks, presentation ideas, and technical know-how to make your cocktails as sensational for the eye as they are for the palate. The first section of the book explains the differences between the different wines to help you tell your spumante from your frizzante, or your extra-brut from your demi-sec. Everything you need to know about your favorite drink is here, including insider secrets such as how to make sure your bubbles don’t go flat. Sidebars tell you every sparkling wine suitable for each cocktail, so you know whether you can substitute Cava for Prosecco, or whether sometimes only Champagne will do! Make every drink a celebration and raise a glass to Let’s Get Fizz-ical: cheers! New Zealand Winegrowers will host its 22nd tasting of New Zealand wines in Ireland in January 2019. With a number of key New Zealand wineries showing at the Dublin show in 2019 there will be over 150 New Zealand wines available to taste. The consumer tickets are now on sale. This is one of the most popular consumer wine events and is a great way to start the wine New Year! Monday 14th January, 2019 Venue: Radisson Blu, Golden Lane, Dublin 8. Tickets are now on sale price €15.00. A great idea as a Christmas stocking filler for the wine enthusiast in your life. One of only 117 bottles available worldwide, the Midleton 30th Anniversary Pearl Edition is the lot to watch at the forthcoming Irish Whiskey Auctions. Expected to sell in the region of €15,000, this exclusive premium Irish whiskey is just one of over 200 lots that will be listed on the online auction, which goes live on November 16 at www.IrishWhiskeyAuctions.ie. Organised by Irish Whiskey Auctions, the company held its first auction last month, with 167 lots up for sale and buyers logging on and bidding from Ireland, UK, Germany, USA and Singapore. Among the lots sold were the complete collection of Irish Midleton Very Rare (34 bottles), selling for €36,100 to a publican from Waterford, and an early collection of ten bottles of small-batch Dingle whiskey, which was sold for €5,500 to a bidder in Singapore. “In January this year, the idea of building Irish Whiskey Auctions came to me during a conversation in L. Mulligan whiskey shop, Dublin. In less than one year we have superseded all our expectations, launching and hosting ‘Ireland’s first online whiskey auction’ with 167 lots and the average bottle selling for €550 – significantly surpassing our expectations of €200 for the average bottle in the first auction,” said Anthony Sheehy, founder of Irish Whiskey Auctions. Spanning nine days, the next online auction launches on November 16th at 5pm and runs until 7pm Sunday 25th November. Users must register to participate in the auctions, but sellers can sell for free as there’s no listing fee for the November auction. Irish Whiskey Auctions was founded by Irish couple Anthony and Catherine Sheehy, and investors include publicans and whiskey enthusiasts Alan Campbell, owner of The Bankers Bar on Trinity Street, Dublin, and Willie Aherne, owner of the Palace Bar on Dublin’s Fleet Street. The company has already invested over €100,000 in creating the online platform, developing bespoke technology to enable a streamline and fair auctioneering process. One of the features includes an automatic page refresh every two seconds, which ensures buyers have the most up-to-date information in real-time. Commenting on the company and his involvement with it, Campbell said, “I have been involved in the whiskey world for the last 20 years and whilst whiskey auctions are common across the UK and indeed Europe, it is hard to believe there wasn’t an online whiskey business portal in Ireland before now. With monthly auctions planned, the company is appealing for people from across Ireland to check their cupboards and presses for hidden treasures, whether it is a bottle, case or a complete collection, which could be sold in one of its upcoming auctions or to get in touch for a free valuation. Speaking about his passion for whiskey and involvement with the company, Aherne added, “Whiskey runs throughout our family history at The Palace Bar, so much so that in October 2013 I opened the Whiskey Palace above my family-owned tavern – The Palace Bar – and we even produce our own whiskey brand. Irish Whiskey Auctions offers collectors and first-time buyers and sellers a simple and professional platform to access the finest whiskey with global reach. The next auction launches on November 16, 2018. For more information, visit www.irishwhiskeyauctions.ie. 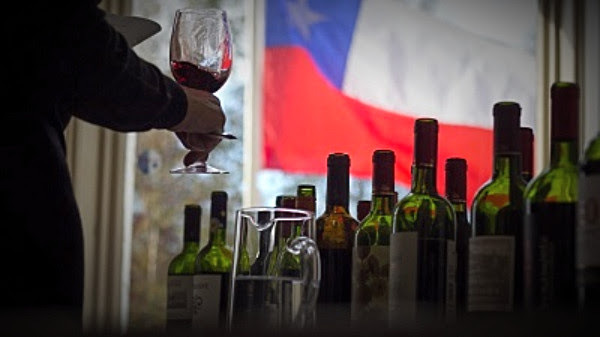 The tasting will take place at theEmbassy of Chile, 44 Wellington Road, Dublin 4. 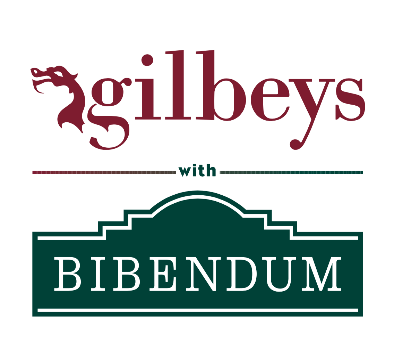 “On Monday 12th of November from 10.30am to 12pm, Bren Smith, from Mackenway Distributor Limited, will be hosting a masterclass for the Irish Guild of Sommeliers. The theme will be “Albarino/Alvarinho” with wines coming from different countries, including Uruguay! As part of the annual Rhône Wine Week activities in Ireland, Côtes du Rhône wines would like to invite you to The Big Rhône Tasting, taking place on Tuesday 6 November 2018 at ely Bar & Brasserie in Dublin. The tasting will be an opportunity to try over an exciting range of Rhône wines from a diverse range of interesting and innovative producers. The wines on offer will include Côtes du Rhône, Côtes du Rhône Villages as well as wines from the Northern and Southern Crus of the Rhône Valley. The tasting will be an opportunity to try over an exciting range of Rhône wines from a diverse range of interesting and innovative producers. The wines on offer will include Côtes du Rhône, Côtes du Rhône Villages as well as wines from the Northern and Southern Cru of the Rhône Valley. Masterclass for the Off Trade 11.00-12.00 p.m.
Our tasting takes a look at some of the Rhône‘s smaller less well known southern AOP’s including Rasteau, Gigondas and Vacqueyras. We will explore Côtes du Rhône and the rise in popularity of lighter red wine styles and of course, we will look at white wine styles from the Rhône. The tasting will highlight current consumer trends and why the southern Rhône is such an important category for Irish retailers. Masterclass for the Restaurant Trade 03.30-04.30 p.m.
We will explore and the rise in popularity of lighter red wine Côtes du Rhône and Côtes du Rhône Village and will look at why they are such a good fit with a broad range of menu styles. We take a look at current consumer trends and why it’s worth going off the beaten track with some of the Rhône’s less well known appellations. We know that when dining out for a special occasion, such as an anniversary dinner, when the Irish consumer trades up it is usually with a French wine. Rhône offers great value and punch way above their weight in terms of price/quality and margin. Our restaurant masterclass will highlight some of the key wines currently available and will also look at white wine styles from the Rhône. Places are limited, therefore if you would like to attend please RSVP by Thursday 1 November tojean@jeansmullen.com to confirm your place at the Masterclass. Pembroke Wines is thrilled to invite you to taste the wines from our portfolio. A host of very special guests on the day will be pouring their own wines. These include Anthony Hamilton-Russell from South Africa, Comtesse Alexandra de Vezailles of the historic Chateau des Bachelards in Beaujolais, and Benjamin Laroche from Chablis. We are thrilled to announce that we will be representing the legendary wines of Stephen and Prue Henschke from Australia, and the highly-respected Pinot Noirs from actor Sam Neill’s Two Paddocks estate in Central Otago, New Zealand. 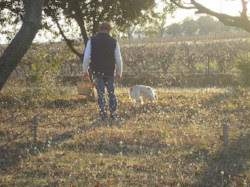 We now represent Bodegas Pujanza, the much-heralded Rioja producer. Be sure to taste these! This is a wonderful opportunity to prepare your wine lists for the upcoming festive season, and to try a few gems that we don’t usually have open. Please RSVP to let us know you’re coming, and feel free to bring your colleagues along, or to share this invitation with anyone from the trade who might like to attend. Please book with Julie Dupouy at down2wine@gmail.com. Located in a fantastic setting 525ft (160m) above sea level in the Garzón hills some 5km from the Atlantic Ocean, Bodega Garzón is considered the most extraordinary wine estate in Uruguay. With the advice of world renowned enologist Alberto Antonini, the hills of Bodega Garzon were planted with a complex network of vineyards that produce wines with a strong identity, expressing the inimitable character and features of the Garzón terroir. During the tasting Alexander Griffiths from Bodega Garzon will take the Guild members through a range of seven wines from Bodega Garzon, explaining the planting practices, micro climates and wine making process which combine as making the fabulous Bodega Garzon wines and explain why the world is looking at Uruguayan wines with a whole new set of eyes. Please make a special effort to attend & be in attendance 10/15 minutes before the masterclass commences. Your full attention should be given to the presenter and given the respect he deserves. “On Monday 19th of September, Jan Pettersen, owner of Bodega Fernando de Castilla, in Jerez, hosted a masterclass for the members of the Irish Guild of Sommeliers. This was a fantastic opportunity for our members to discover or rediscover the different styles of wines produced in the region of Jerez guided by the expertise of Jan. Some of the wines tasted included their classic Fino, aged under flor for 3-5 years. A light-bodied wine, made from free run juice only, with a lots of salty characters ; ideal pairing with fresh oysters according to Jan. The next two wines were two Amontillado with two different ages, the Antique being over 20 years old. Amontillado wines start as Fino and after a few years, the wines are fortified to a higher level of alcohol (18% abv.) to continue their ageing in an oxidative environement which will gives them some richer, earthier, more savoury characters. The last two dry wines of the day were the Oloroso from the House and the very rare Palo Cortado. The tasting was concluded with a sampling of a very old Pedro Ximenes. A wine with an average of 500 gr/L of sugar but demonstrating an incredible balance. Intense, luxurious and incredibly complex, a real meditation wine. Finally, Jan introduced one of his newest creation. A vermouth based on Sherry wines and over 20 botanicals. A beverage not available in Ireland yet but with great potential to seduce the Irish consumers! 50 years after the first edition of the world’s most prestigious sommelier competition in Brussels (1969), the “ASI Best Sommelier of the World” is returning to Belgium once again. 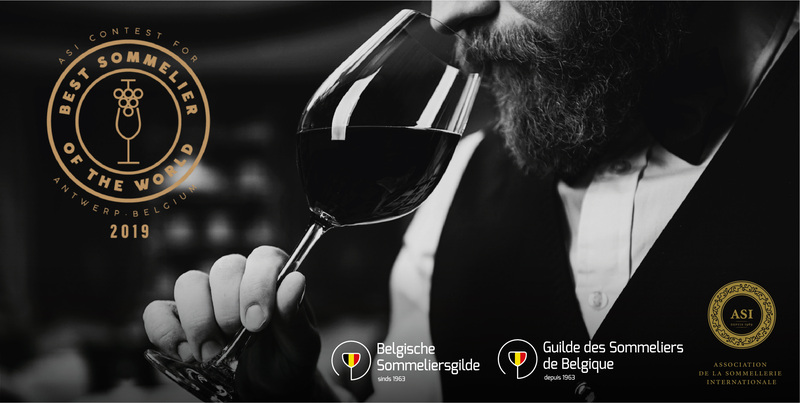 Over 65 sommeliers from 62 countries will be competing for the title of Best Sommelier in the World in Antwerp, from 11th-15th March 2019. From 11th-15th March 2019 the 16th edition of the most prestigious sommelier competition in the world will take place in the ‘Elisabethzaal’ in Antwerp. This unique triennial world championship has been organized by ASI (Association de la Sommellerie Internationale/ International Sommelier Association)and the national sommelier associations since 1969. Many legends of the international sommellerie took part of this contest over the past half-century. The first edition of this competition took place in Brussels in 1969. 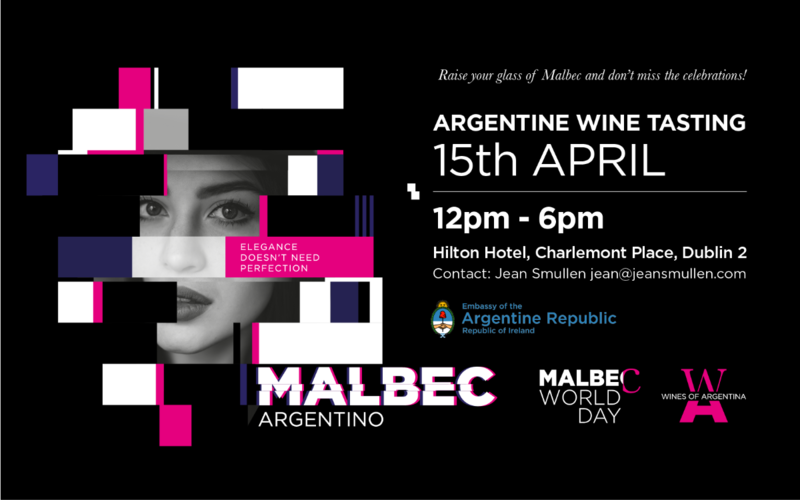 Now three years after it was last held in Mendoza, Argentina, the competition returns to its roots in Europe. A total of 65 sommeliers will take part in the competition in March 2019, which starts with the quarterfinal on the 11th March and ends with the grand finale on 15th March. In the final the three best sommeliers will battle for the most prestigious title in their craft worldwide. 62 countries will each present their most qualified candidate. This will include the three winners of the continental championships, namely Europe & Africa, Asia & Oceania and America. The new edition of this international competition will be the perfect opportunity to show professionals and the public how the craft of sommeliers has evolved over the years. “Today the job involves much more than just pouring wine. Not only does a sommelier dispense a broad knowledge of the ever dynamic wine industry, but also other drinks such as beer, spirits, water, coffee, sake, etc. They also need to have an eye for human interactions, have a broad social intelligence and needs to deal with several economic criteria such as efficient management of supplies” says William Wouters. The partners joined Antwerp to accompany this presentation of the competition to the press. The diamond capital will become that of the sommellerie next March. An exceptional meeting of which Terre de Vins will be one of the partners. Fifty years after the first ASI competition for Best Sommelier in the World won by Frenchman Armand Melkonian, Belgium has been preparing for more than two years to welcome once again (*) the most prestigious event. And this Tuesday, September 18, less than six months of the event, the case took a very concrete turn with a presentation of the stakes of the competition, the ambitions of the organizers and the commitment of the partners. While the member countries of the International Sommellerie Association still have a few weeks to select and register their representative, the three shots were given in a building with futuristic architecture that dominates the commercial port of the Flemish city. In the presence of Andrès Rosberg , Michèle Chantôme and Philippe Faure-Brac , respectively president, secretary general and treasurer of the ASI, William Wouters, president of the Gilde of the sommeliers of Belgium, spoke with humor and emotion the long preparatory work. For if the more than sixty expected participants train on a daily basis in order to better defend their chances, in the shadows a team of volunteers works in Belgium to offer them the best possible conditions during the competition. And here, everything is a matter of means! The contribution of the partners at the forefront of which include the wines of the Cotes du Rhone and Austrian Wine is therefore essential to accommodate the national delegations and the media that will follow the contest disputed in three stages. In this context, Terre de Vins (represented in Antwerp by Rodolphe Wartel its director) and its readers will occupy a privileged place since our title was chosen as a press partner for France as were Decanter for the United Kingdom and Meininger for Germany. A media orientation that goes in the direction desired by President Andres Rosberg upon his election, a little over a year ago in Bordeaux. The contest is also an exceptional promotional showcase. To exploit this facet, France wine has largely mobilized in the image of Gérard Bertrand, the Malartic vineyards, the Clarence Dillon estate and the Perrin Family who have joined a very international pool of support where appear actors of the world Portuguese, Italian and Spanish winemakers. Domains and houses that will accompany the competition with master classes, tastings and presentations during the lunches and dinners planned in Antwerp from March 10th to 15th. Finally, the diamond world will also contribute with, for the winner, a cluster-shaped brooch set with white and green diamonds. A unique model specially made for the occasion by the Untold house. (*) In Brussels in 1983, after two Italian successes, Jean-Luc Pouteau brought the title back to France. 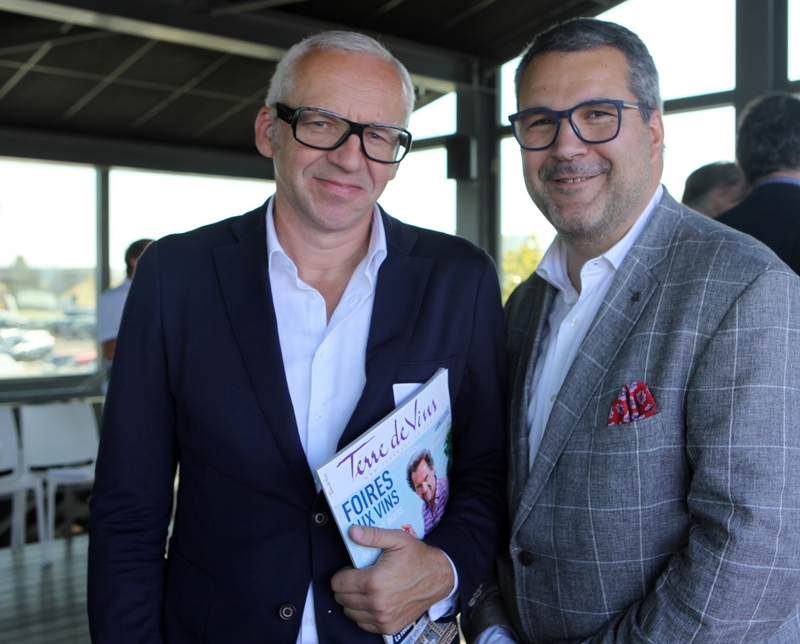 Below: Rodolphe Wartel and William Wouters united by the same desire to promote the profession of sommelier through the 2019 world. Become part of the brand-new California Wines’ Sommelier Sessions! We will run a series of Sommelier-led wine sessions. These will not only be a great opportunity to network with your peers, but also to train and develop your California wine knowledge and your Sommelier skills. An ideal opportunity for those preparing for their WSET qualifications, MW or Court of Master Sommelier exams. Anja Breit, former Head Sommelier of the two Michelin starred Ledbury Restaurant in London, will lead the Sommelier Sessions. We will organise several different wine club activities such as masterclasses, wine talks/discussions and blind tastings. You will have the opportunity to taste 12 – 20 Californian wines at each session. Our inaugural tasting is on Monday 17th September, at Pembroke Wines, Burlington House, Waterloo Lane, D4, from 3-5pm. And we kick off with a blind tasting! Wines will be divided into flights, themed by region or variety, and tasted along with some themed questions to keep you focused! A great opportunity to sharpen up your blind tasting skills! Californian wines are the perfect backdrop for this blind tasting series – such a geologically diverse region produces wines that show a great range of climates and terroirs. Most of the state’s wine regions are found between the cool Pacific Coast and the warm Central Valley. Indeed, the Pacific Ocean and large bays, like San Francisco Bay serve as a tempering influence to the wine regions throughout the state by providing cool winds and fog that balance the heat and sunshine, leading to an incredible diverse range of wines. Learn about these factors by tasting through the line-up blind and challenging yourself to identify the key characteristics of Californian’s different regions. The President of the Irish Guild of Sommeliers Oliver Murtagh has announced that Julie Dupouy – Young will be the Irish Guild of Sommeliers candidate at the ASI World Sommelier Contest which will be held in Antwerp, Belgium in 2019. The deputy candidate Tomasz Szczepanski was also named. Julie Dupouy – Young works as a Sommelier at Chapter One Restaurant Dublin, Champagne Brand Ambassador Edward Dillon & Co. Ltd as well as running her own independent Consultancy, Down2Wine. She is the Irish Guild of Sommeliers Best Sommelier of Ireland 2018, a title she has held since 2009. Originally from France, Julie Dupouy – Young has lived in Ireland for many years, and has previously worked as sommelier for the Michelin star Greenhouse Restaurant, Village at Lyons and two-Michelin star Restaurant Patrick Guilbaud among other restaurants. Tomasz Szczepanski is the Head Sommelier at Shanahan’s on the Green Restaurant Dublin. He achieved second place in the 2018 Irish Guild of Sommeliers Competition and was also placed fifth in the Polish National Sommelier Competition. Originally from Poland Tomasz Szczepanski has worked at Las Tapas de Lola, Marcel’s and La Maison restaurants in Dublin. Prior to coming to Ireland he was a Wine Sales Representative at Centrum Wina (Wine Centre), Kraków, Poland. He was awarded the Junior Sommelier title in 2014 in Warsaw, Poland. With great sadness I learnt of the death of Giuzeppe Peruzzi who died on Monday 30th July, 2018. Giuseppe was a long standing member of the Irish Guild of Sommeliers and a regular attendee at many of the tastings in Dublin. No wine event was complete without Giuseppe there and his support for all the trade events for many many years was very much appeciated by us all. Sincere condolences to his wife Egidia and his children Walter and Fabiola. He will be sorely missed by everyone in the wine trade who knew him. His funeral will take place on Friday morning, August 3rd at St. Attracta’s Oratory, Meadowbrook at 10.00 am, followed by cremation at the Victorian Chapel, Mount Jerome, Harold’s Cross at 12.30 pm. “I’m so, so sorry to hear of Giuseppe’s death RIP. Giuseppe was such a gentleman, gracious and concerned and was so nice to me since the first day I joined the IGS. I’m so happy we met again in CHQ recently and had some funny banter just before our last tasting. I will always have very fond memories of Giuseppe. Paris, France, July 26, 2018– As the Association de la Sommellerie Internationale (ASI) prepares to celebrate its 50thanniversary, in 2019, the 49thGeneral Assembly, held recently in Tbilisi, Georgia, reiterated its goals of modernizing and reinforcing the sommelier trade and widening its international reach. The Association also prepared for a very full three-year agenda that includes the Best Sommelier of the World contest in Belgium and the 50thanniversary celebrations in Champagne, both in 2019, as well as continental competitions in Japan, Cyprus and Australia and an annual meeting in Ningxia, China. More than 70 delegates from 47 member countries took part in the 49th ASI General Assembly. They gave strong support to President Andrés Rosberg and the Board of Directors and their vision for the development of ASI and the sommelier profession. Through various presentations in the Georgian capital, the Board and various committees explained their approach to bringing ASI further in line with the current industry context, and to support contemporary sommeliers as their contribution and influence keeps getting more and more significant. The President and Board of Directors stressed the importance of ASI’s almost 50-year history, and reiterated its commitment to the values of the profession, such as hard work, excellence, humility, love for wine and constant learning. At the same time, Rosberg pointed out the importance of making sure ASI flourishes and reinforces what makes it unique, as the largest global sommelier association and the leader in international sommelier contests and as an association invested like no other in the future of sommellerie. 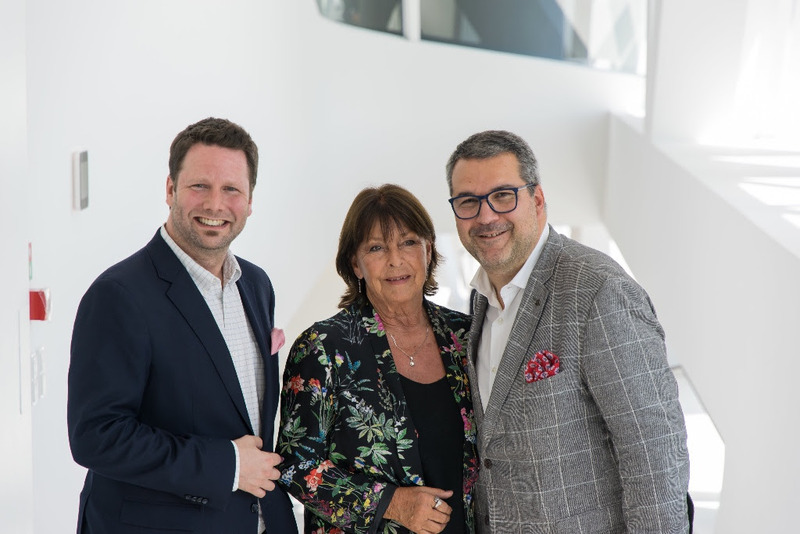 Peer F. Holm, president of the German Association, is succeeding Jean Pallanca of the Monégasque Association as head of the By-Laws Committee, a position Pallanca had held for more than 20 years. The two of them led the vote for new membership applicants. Two countries were voted in as new observer members; New Zealand and the Philippines. They were respectively represented in Tbilisi by Ms. Celia Hay and Ms. Charmaine Wang. In addition, Peer Holm had meetings with several other potential new members who are interested in applying next year. Reports of past and upcoming continental and world sommelier contests were also presented by representatives of the host associations. Michelle McCarthy (on behalf of Canadian president Mark DeWolf) reported on The Best Sommelier of the Americas contest, which took place in Montréal in May. Saiko Tamura-Soga (on behalf of Japanese president Shinya Tasaki) presented the program for The Best Sommelier of Asia & Oceania contest, taking place in Kyoto this coming fall. William Wouters, president of the Belgian Sommelier Association and Vice President for Europe, laid out the schedule for The Best Sommelier of the World contest, which will take place in Antwerp in March 2019. Georgios Kassianos, president of the Cypriot Sommelier Association, presented a preliminary program for The Best Sommelier of Europe & Africa contest in 2020. Sarah Andrew, co-president of the Australian Sommelier Association shared plans for The Best Sommelier of Asia & Oceania contest for 2021. As Australia was the only candidate and presented a solid proposal, ASI voted unanimously for this bi-continental contest, the first in ASI’s history to be held in Australia. The 2019 general assembly was given special attention by Secretary General Michèle A. Chantôme, since it will coincide with the celebration of ASI’s 50th anniversary, scheduled to take place in France in June 2019. 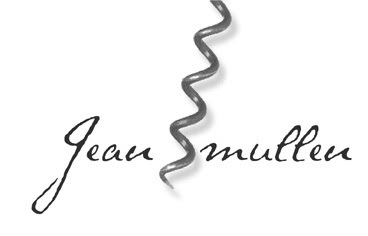 Seeing that June also marks the anniversary of the Union de la Sommellerie Française, UDSF president Philippe Faure-Brac offered to host the general assembly in Paris before the 50thanniversary celebrations, which will take place in Champagne, the birthplace of ASI. The Ningxia wine region, in China, is ASI’s newest partner and has offered to host the Annual Meeting and general assembly in 2020, a proposal that was agreed upon through a unanimous vote by ASI members. Two of ASI’s partners were present and gave brief speeches about their companies. Sommeliers International, a partner for more than 10 years, was represented by president Eric Allouche. Sébastien Lézier, owner of new partner Ligne W/Château Laguiole gave a presentation on his company, and also presented all Assembly participants with a sample of their product: a special corkscrew made from used wine barrels, engraved with Georgia 2018 and ASI’s new logo. The Association de la Sommellerie Internationale is a non-profit making association founded in Reims on the June 3-4, 1969, and based in Paris, France. 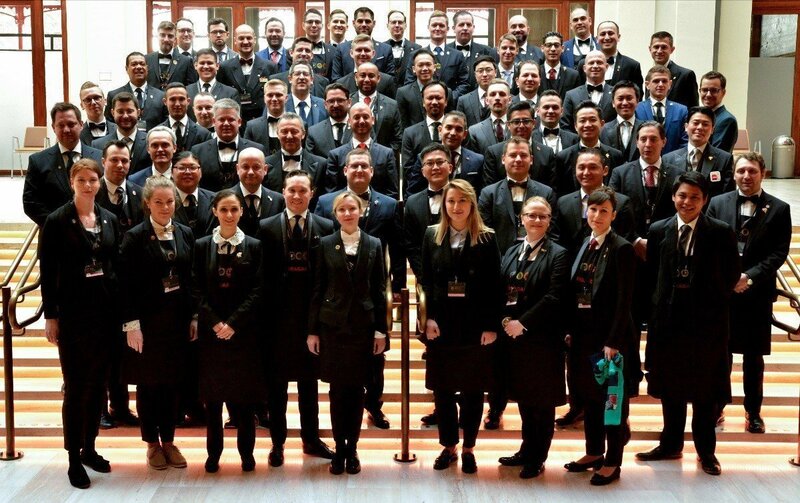 It brings together the national sommelier associations of sixty countries, and represents a global community of thousands of sommeliers around the world. It promotes sommellerie worldwide by increasing awareness, developing sommellerie where it doesn’t exist, and improving the level of sommeliers where it does, and educating consumers and professionals alike. It defends the ethics of the profession and advocates for the consumption of alcoholic beverages in moderation. It is notably responsible for major international sommelier competitions, including continental contests as well as the ASI Best Sommelier of the World contest held every three years since 1969. Should original files be needed, please contact Liora Levi. New Zealand Winegrowers has today opened applications for the 2019 Sommit™ Scholarship for Sommeliers from the UK, Ireland and mainland Europe. First launched in 2015 with Sommeliers Australia, the scholarship is now a global initiative with the European sommeliers joining scholars from Australia, Asia, Canada, New Zealand and the USA in 2018. The New Zealand Wine Sommelier Scholarship provides passionate wine ambassadors the opportunity to take part in a memorable wine experience, discovering the regions, varieties, landscapes and personalities that make New Zealand wine unique. Limited to just 20 sommelier attendees, the 2019 Sommit™ will be held in Hawke’s Bay on Friday 25th and Saturday 26th of January. Hosted by Master of Wine Stephen Wong, the events are a celebration of the lesser known aspects of New Zealand wine, with particular emphasis on the facets that resonate with the sommelier community. Joining Stephen this year as a host, will be a former alumni of the Sommit™, Master Sommelier Ronan Sayburn. 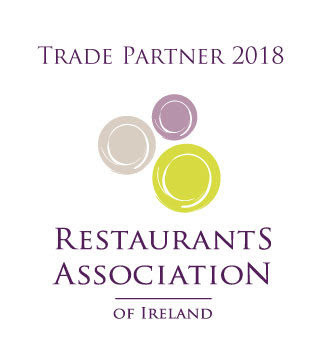 VERY IMPORTANT – Those applying must be Bone Fide working Sommeliers in Ireland who have buying power and are actually currently working for a hotel, restaurant or other relevant establishment. “Rioja” and the “Spanish Embassy” will be holding a masterclass and tasting about Rioja, focusing on the last regulations approved by the control board and different wine styles. The tasting and masterclass are only open to Trade and Press. Montreal, May 25 – The new best sommelier of the Americas, Mr. Pier-Alexis Soulière, said he is now focusing on The Best Sommelier of the World contest, Belgium 2019, after closing an intense week of competition with 19 other sommeliers from 10 countries representing the continent. As the winner of the ASI & APAS Contest of the Best Sommelier of the Americas, Canada 2018, Soulière qualified directly to the sommelier world’s most important competition. Soulière became the best sommelier of the Americas last Thursday after winning a dramatic final over Argentina’s Martin Bruno, who came in second, and Canada’s Carl Villeneuve Lepage, who took third place. The results confirmed that Ms Valeria Gamper, from Argentina, finished number four, and became the best female sommelier of the continent. Regardless the tradition of female competitors winning the previous editions, this 2018 edition of the competition had only two women taking part. Misato Inaoka, representing Chile came in on the tenth position. Behind Valeria Gamper, the other semi-finalists ranked in this order: Luis Antonio Morones Lopez, from Mexico, was fifth, Diego Arrebola, from Brazil, sixth, Joseph Ruiz Acosta, from Peru, seventh, and Steve Ayon Espitia, from Mexico eight. The remaining participants were: Mr. Juan David Quintero from Colombia, Mr. Dario Rosario Mejía and Mr. Federico Díaz Macias from The Dominican Republic, Mr. Simon Zalimben and Mr. Christian Mezger from Paraguay and Mr. Diego Vásquez Luque from Peru. 15thto 18thof October 2018 The Best Sommelier of Asia & Oceania is taking place in Kyoto. 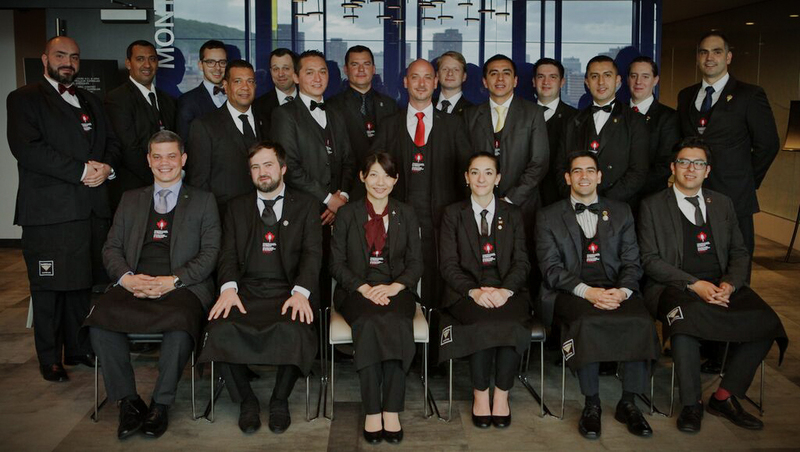 Japan has one of the world’s largest sommelier associations with more than 13.000 members. 10thto 15thof March 2019 The Best Sommelier of the World is due in Antwerp, Belgium. Preparations for the contest have already been on going for a year. Julie has been in the wine business since 2003. She started working in France and shortly after moved to Ireland with a short stop in Belgium, Luxembourg and Scotland too. Her education started with languages and French literature studies, but she decided to go to catering as she wanted to become a sommelier. Julie passed her “mention complementaire sommellerie” in 2003. Since then she has studied with the WSET and achieved Diploma in 2015 as well as WSET Level in Sake in 2017. She has held the title of best sommelier of Ireland since 2009. Before competing in Ireland, she entered the Best Sommelier in France in 2008 and was one of the 12 semi-finalists. Julie also competed at the World Championship in Tokyo and Mendoza and the European championship in San Remo and Vienna. Her best international performance was at the World Sommelier Contest in Mendoza 2016, where she placed 3rd. Her dream is to show to the world that a lady can be No1 in the world of sommellerie. Her qualities as a sommelier are widely recognised and as a judge in some of the most prestigious wine events in the world, the Decanter Awards in London among others. Today she is working as a sommelier in a Michelin-star restaurant called Chapter One in Dublin 1. Q1: You won the sommelier contest in Ireland in 2018. Did you expect it and how do you feel about it? Julie: I am delighted to have won the title of Best Sommelier of Ireland again. You can’t ever expect to win a competition. You can be confident that you have done the work and that you have the potential to earn it, but you still need to be able to deliver your best on the day. Things went very well this time, and I am delighted with the result. Q2: How do you think the title of Best Sommelier of Ireland will change your life? Julie: I am incredibly proud to have won Best Sommelier, and hopefully this will give me the opportunity to work towards my ultimate goal and dream which would be the first woman to win the World title. This title would then allow me the platform to inspire other sommeliers, particularly women. Q3: What is the status of sommeliers in Ireland? What can be improved? Julie: Despite the fact that we do see a considerable amount of improvement regarding the wine culture in Ireland, there are not many sommeliers in the country. First of all, there is no official qualification delivered in the country to become a sommelier. I think it would be fantastic if we could see a sommelier certificate offered by the catering schools in Ireland. The WSET is very present, but the focus is on knowledge and not the service aspect of the job. A few people in the country now travel around Europe to attend the Court of Master Sommelier classes which shows that there is a growing interest and that people are willing to invest in their wine qualification, often taking time off on their holidays, but I believe that it should be available in the country. Q4: You have a great knowledge about food and wine. What do you think you can do to promote your national beverages and gastronomy? I absolutely love the food offering in Ireland lately. The standards of quality, especially when it comes to meat, dairy products, locally grown vegetables and sea food is outstanding and I do my best to spread the good word as much as I can on social media. I also have been invited to talk at “Food on the Edge” this coming October which is a great honour as ethical eating and food education is a topic which is very dear to me. Regarding beverages the offering of craft beers, gin and whisky has boomed in the last few years and I am always proud to bring some examples with me to different countries I go to introduce them to my colleagues and peers. In Chapter One Restaurant we also have by the glass the only Irish wine produced by Lusca and a strawberry wine produced by the Wicklow Way Wines, it gives an opportunity to the tourists visiting the restaurant to sample some local beverages and to the locals to discover some products they might not be familiar with. Please allow me to introduce our inaugural newsletter, which will be sent to you in the beginning of each month with the news of ASI, its national member associations, and, of course, its partners. We encourage you to resend it to the members of your association, and to share your news with us so we can tell the world about it! ASI is now gearing up for its first continental competition of the year: the ASI & APAS Best Sommelier of the Americas contest, which will be held at the end of May in the fantastic city of Montreal, Canada, and will gather together the best two somms from eleven Pan American countries. This major event is a tremendous opportunity to increase the exposure of our global association and to improve the overall level of sommellerie throughout the Americas, and we will report about it in next month’s issue of #ASInews. Also, after ten months of hard work of the new Board and Committees of ASI, we’re starting to reap what we have sown. There is more and more good news coming our way. Today we are honoured to unveil ASI’s new logo to the world, approved by the vast majority of our members, and praised by our partners! There is something intrinsically universal in the shape of a circle that perfectly symbolizes the very nature of ASI. From a practical standpoint, the circle is also an incredibly versatile form that ideally suits our needs! Building on a rich history, ASI is evolving to meet the needs of both current and future generations. The new logo and newsletter are just two examples of how ASI envisions its future by creating opportunities for increased member and industry engagement, building international commitment to the profession, and expanding outreach to the sommellerie community. In other words, making our association stronger and more global than ever. Enjoy reading and we look forward to having you with us on the journey! InterBeaujolais will be holding a Masterclass on the 10 crus, Beaujolais, Beaujolais Villages, white and rosé, focusing on the differentiation of soils in the region. On some of my trips as active in the Swedish sommelier association, I have had the privilege of meeting this talented and talented summer traveler who, with his goal awareness and sharpness, is a good example for many both in the competition scene and in everyday work. Since there is still a lot of male dominance in our profession, it is always nice to highlight talented and intelligent women like Julie. Julie is born in the city of Agen, located in southwestern France, now living in Dublin since 2007. The reason she has chosen to settle there has to do with the Irish hospitality and the warmth she has met. Her sommelier education took her in the city of Nerac. After completing her studies, she moved to Ireland to work and study at WSET in London. Now she has acquired 15 years of experience in sommelier work around Europe. Her contestants, she joined France in 2002 when she still went to school. The first success she had in 2008 in the French Championships where she went to the semifinal. After that, it became the World Cup in Tokyo 2013 where I met her for the first time. Today she is Irish Masters in Summer Celebration. In the major international competitions she has participated in EM 2013, 2017 and the 2013 and 2016 World Championships in Mendoza, she finished third. On the question why she competes in summer celery she answers-I love challenging myself, when you compete, you must be able to perform great international knowledge in the competition scene as well. In order to do this you need to know yourself, know your strengths and weaknesses. You need to be prepared to work on them. International competitions can help you strengthen your profile while contributing to increasing your professional network. Unfortunately, there are still more men than women in international competitions. I also asked what the competition gave her? Then she answers – increased self-confidence and security. It has helped her to constantly improve herself and that there is still a lot of work left to do. It has also taught her to remain humble. With this, meetings have been encountered with amazing people, including those who have been her role models and inspirators as young sommelier. Many of her dreams have been realized thanks to the competition. On my question about the three biggest passions in life, Julie – Vin answers. Her hobbies are crossfit, golf and and of course cooking and hanging out with good friends along with something good to drink. Do you want to visit Dublin and the restaurant that Julie is working on, go to Chapter 0ne with a star in Guide Michelin. A presentation was made to Amy O’ Callaghan by Oliver J. Murtagh, President Irish Guild of Sommeliers on behalf of the visiting group. Oliver thanked Amy O’ Callaghan most sincerely for organizing an excellent programme for the visit of the group from the Irish Guild of Sommeliers to the White Hag Brewery, Ballymote, Co. Sligo. “The brewer Do was most informative in explaining the production process and the different beers tasted. Overall it was very interesting to taste such a diverse range of craft beers to suit all palates. Your hospitality and generous gift of beers for all was much appreciated. I wish you and all connected with the brewery every success for the future”. The White Hag Irish Brewing Company is an award winning craft brewery from Sligo, Ireland. A young Irish team and a master brewer from Ohio, US, exploded on the Irish brewing scene in 2014 with a huge range of unique beers. Over the past 4 years they have grown to have their beer available in good pubs, beer shops and hospitality across Ireland, the UK, Northern Ireland, France, Russia, Germany and Italy. The White Hag has been voted Best New Irish Brewery 2015, Beoir Best Irish Brewery 2017 and best Irish beer 2017 by Global ratings platform RateBeer.com. Since commencing brewing in June ’14, they have had beers in the top 3 individual Irish beers of the year for 2015, 16 & 17. So, whats with the name? The White Hag is a mythical character and entity, who is essentially Mother Nature. The area of the north west and indeed Ireland is steeped in mythology and lore, with most place names and landscape features linked to characters and happenings from ancient times. The mythology of our area represents Ireland and Irishness like no other aspect of our culture, and we see it as a credible way to present our brand of brewing and beers. The main reason for our exact location of the brewery in Sligo is the water from Lough Talt, which is just the right PH balance for making great beers. The lake itself is fed by streams from the 600 million year old Ox mountains. Since we started the brewery in 2014, we have met some brilliant characters and brewery crews across world. It struck us that when two or more breweries get together the atmosphere turns into a collaborative, collective aspiration to work together in pursuit of endless possibilities. We also noticed that the best events are run by breweries hosting other breweries, and we’ve wanted to create that type of event since we’ve started out. Our Second Birthday allowed us realise we could do it properly when 260 beer fans turned up at two weeks notice, to drink with us and our favourite breweries. Last year 23 of the best breweries we’ve met on our travels brought beers never poured in Ireland, and joined over 1000 punters in descending on Ballymote to create a magical festival, HAGSTRAVAGANZA. So we’re doing it again. We are focusing on bringing sixteen breweries from ten countries leading the way in craft beer, pouring three beers each. We will also have a select crew of the best Irish Breweries pouring a unique beer each. Aside from breweries who we’ve done collaborations with, ALL of the breweries are new to HAGSTRAVAGANZA, and ALL of the beers have never been poured here before. Archway Lager, an expert blend of 3 hops and 4 malts used to create a lager that’s exceptional in both substance and flavour. Julie Dupouy –Young has been crowned ‘Best Sommelier in Ireland’ by the Irish Guild of Sommeliers. She is pictured with her trophy which was presented by Oliver Murtagh, President of the Irish Guild of Sommeliers. (Picture by James Robinson). The French-born sommelier, who had just moved from the Greenhouse Restaurant to Chapter One, emerged winner in a day-long competition held at DIT Cathal Brugha Street. She scored highest marks following a series of tests involving theory and practical work, in which sommeliers from some of Ireland’s leading hotels and restaurants also participated. Tomasz Szczepanski , head sommelier at Shanahan’s Restaurant in Dublin was runner-up and Andrezej Dasiak sommelier at Hodson Bay Hotel, Athlone was placed third. A day of intense competition took place at the Blue Room Restaurant, School of Culinary Arts and Food Technology, Dublin Institute of Technology, Cathal Brugha Street, Dublin on Wednesday 7th March competitors from prestigious establishments battled it out for the title of Irish Guild of Sommeliers Best Sommelier of Ireland title 2018. A wide ranging questionnaire and written analysis of a red wine and a white wine were completed by all the candidates and from that emerged three finalists after a very close contest. The three finalists were as follows: Julie Dupouy, Chapter One Restaurant, Dublin, Tomasz Szczepanski , Shanahans on the Green Restaurant, Dublin and Andrzej Dasiak, Hodson Bay Hotel, Athlone, Co. Westmeath. All finalists displayed their skills and knowledge over a wide range of practical tasks judged by an expert panel of judges representing the hospitality industry, hospitality education and journalism. The entire competition was overseen and run in a professional manner by Oliver J. Murtagh, President Irish Guild of Sommeliers ably assisted by the technical committee. The “sobering challenge” posed by Brexit to the Irish Tourist industry was highlighted. With its negative effects on visitor numbers from a weakened sterling and uncertainty reminds us that we are an island nation dependent on the vagaries of other large economies and there is never room for complacency in the hotel and restaurant sector. Oliver J. Murtagh President thanked all the competitors for entering and hoped they enjoyed the experience and encouraged them to continue with their studies. He wished them all well for the future in their chosen profession. Anne Roque, from Domaine Laroche, will host a Masterclass about Chablis 1er left bank VS Chablis 1er cru right bank. This tasting was supposed to be taking place earlier this year but was cancelled at last minute because of the storm Ophelia. 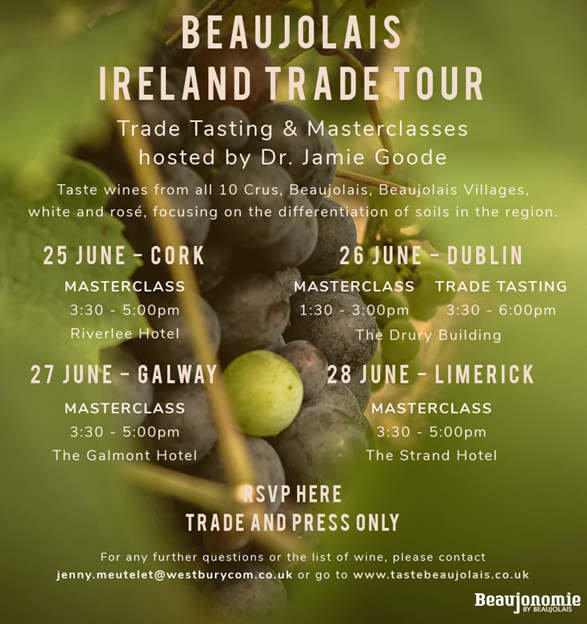 Anne Roque is coming especially to Ireland to host this tasting so please make sure to book this date. You can email Julie at down2wine@gmail.com to book your space. Don’t forget to bring you own glasses ! Anton Miller, Master Brewer at The Spital Brauerei in Bavaria is flying especially from Germany to host a Masterclass for the IGS’ members. Anton became the youngest master brewer ever in Bavaria at the age of 21. He is a qualified beer sommelier and is a jury member of the World Beer Cup and European Beer Star. This a great opportunity so please don’t miss it ! Book now with Julie at down2wine@gmail.com. Don’t forget to bring your glasses! https://jeansmullen.com/WineDiary/Index/138Venue: Radisson Blu Hotel, Golden Lane, Dublin 8. Masterclass presented by Martin Moran MW entitled New Zealand Aromatic Varieties and Smaller Plantings will commence at 13:00 Places MUST be pre-booked and are offered on a first-come, first served basis. Please email Jean to book a place. The Australia Day Tasting, the largest trade tasting of Australian wine in Ireland, is now less than two months away. For 2018 we’ve moved to The Mansion House to accommodate even more wines, exhibitors and visitors. There will be over 300 wines from 54 wineries. Some of the producers may be familiar names like De Bortoli and Vasse Felix, others will be new discoveries such as Howard Park and Voyager Estate that are seeking distribution. This is also your chance to meet the people behind the wines. Winemakers and winery owners flying over for the event include Andrew Watson (Woodlands Wines), Chris Pfeiffer (Pfeiffer Wines) and Trevor Dickinson (Dickinson Estate Wines). Also don’t miss the Iconic Australia Focus Table. From fresh Hunter Valley Semillon to rich Rutherglen fortifieds, this area will give you a taste of Australia’s most enduring and iconic wine styles. We hope you can join us to explore the quality and diversity of Australian wine.